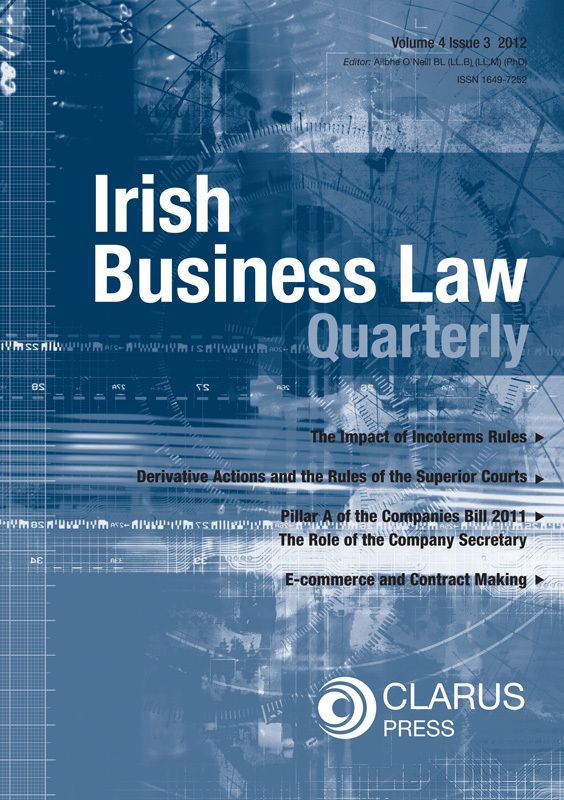 Clarus Press is delighted to announce that the Irish Business Law Quarterly (IBLQ) from 2013 will become the Irish Business Law Review. 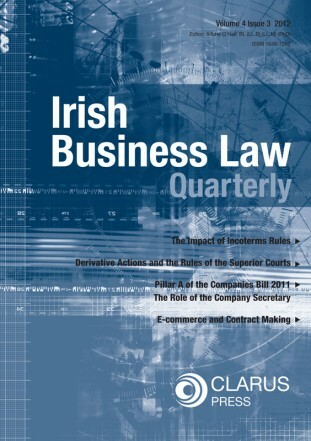 The new journal will build on the great success of the IBLQ For further information please click here: Irish Business Law Review. Archive information in relation to the IBLQ can be found on this page. 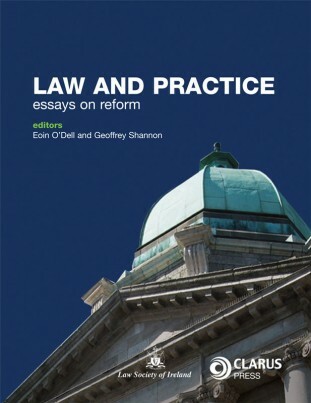 Former editors of the IBLQ include, Dr Ailbhe O’Neill, Aillil O’Reilly and Lyndon McCann. The IBLQ was designed to give busy legal practitioners practical information on important developments in Irish business law. 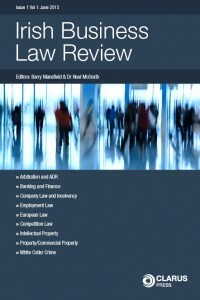 This unique tool for legal practitioners this new journal offers consistent expert analysis on developments in business law. Subjects covered include, Company, Corporate Banking, EU, Taxation, Contract, Financial Services, Pensions, IP, Partnership and Regulated Markets. Company Law update, includes cases and comment on the restriction of directors under section 150 of the Companies Act 1990. Intellectual Property includes an update on patent, copyright, trademarks and EC Regulations on Customs actions against certain goods. Pensions update focuses on the implementation of the “Institutions for Occupational Retirement Provisions” Directive. Money Laundering feature gives an overview of the “Third Money Laundering Directive. Employment Law update comments on the “Consultation Directive”, Ryanair v Labour Court (industrial relations) and Maher v Jabil Global Service Ltd (stress at work). Contract update includes comment and analysis on Cara Environmental Technology v McGovern (jurisdiction to sue for breach of contract), Mr Binman Ltd v Limerick County Council (judicial review), Murgitroyd v Purdy (restraint of trade). **© Clarus Press. Disclaimer: No part of this journal extract may be reproduced without written permission from the Publishers. The comments of the author’s, contributors and reviewers are their own and not necessarily endorsed by the Publishers, Editor or Editorial Board. Accordingly the Publisher, Editor or Editorial Board accept no liability for the consequences of any such inaccurate or misleading data, opinion or statement. 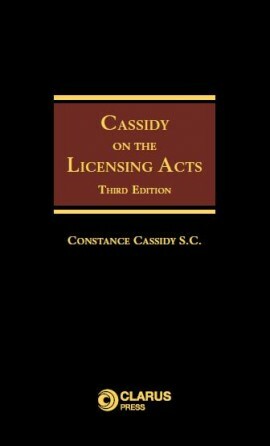 The Publisher’s decision is final and no correspondence will be entered into. 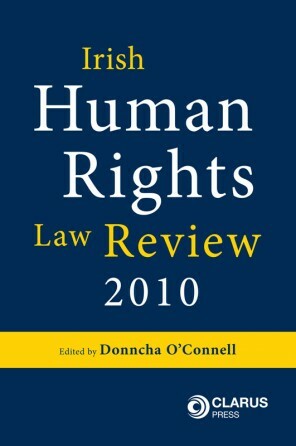 The utmost care has been taken to ensure accuracy of detail, but the publishers cannot accept responsibility for errors or omissions. 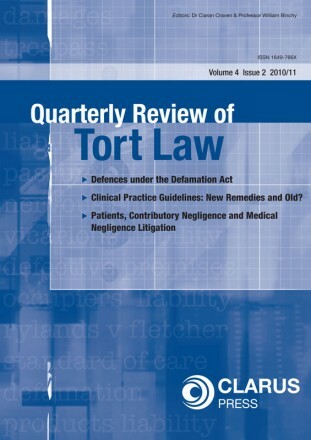 This publication should not be used as a substitute for legal advice.